Philip Hammond’s autumn budget is being heralded by the Daily Mail as offering a “Phil-good factor”, by The Times as a “giveaway gamble” and “no tricks… just treats” by The Sun. But more discerning publications, notably the FT, point out that the plans were delivered with a plea to hard Brexiteers not to vote down Theresa May’s deal, while HuffPost has found the policies “buried in the budget”. The Mirror sums it up well: “a great con job”. Increases in the personal allowance threshold and the higher rate income tax threshold, with nearly 90% of the benefits going to the top half of households, expose the government’s true priorities. The so-called national living wage? Still well below the real living wage. Schools? £400m for “little extras”, in Hammond’s own words. Potholes, on the other hand, got a £420m boost, while public transport remains underfunded. It is expected that the Home Office and Ministry of Justice will continue to suffer deep cuts, and Universal Credit is going nowhere despite heavy criticism from users and benefit experts. Local government, where arguably funding is most needed in order to restore the health of frontline services, was forgotten. Here’s my quick look at the autumn budget and Corbyn’s first response. It’s clear from the high level of industrial action taking place that austerity is not over, says Shelly Asquith in her TU-esday new column, which rounds up the key trade union activities of the week. The CWU are fighting back against the planned closure of Post Offices, and for the 800 jobs at risk; there’s a Unite/GMB petition for a shipyard in Devon also threatened with closure; strikes at a Scottish leather tannery; and much more. 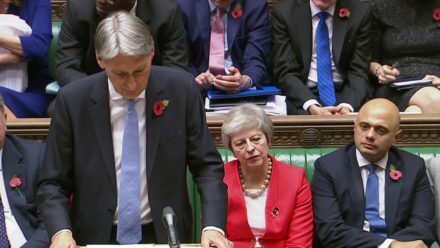 John McDonnell last night put out a video on the failures of the Tory budget, and the Shadow Chancellor will be challenging Hammond directly in the Commons budget debate this afternoon. Using the Resolution Foundation’s analysis and perhaps that of the Institute for Fiscal Studies being released later, McDonnell is likely to call this a “broken promise budget” – because austerity is not over.